stylos: Cove Creek Pirates Repeat!!! Last Saturday (6.18.16) was Championship Saturday and the Closing Ceremonies at Cove Creek baseball park. The Pirates, my son Isaiah's team which I coached, won the Major League (11-12 year olds) regular season with a 12-4 record and played in the tournament championship against the Cubs, a rematch from last year's tournament finale. It was an epic game. After the regulation sixth inning we were tied at 6-6 and went into extra innings. Finally, in the bottom of inning 8 the Pirates scored a heart stopping walk-off run to win 7-6 and achieve a repeat of last year's championship. It was a good day in the Riddle household with my son Joseph's Minor League team, the Rangers, also winning their championship. Image: Isaiah was voted the Sportsmanship Award by his peers for the third consecutive year. 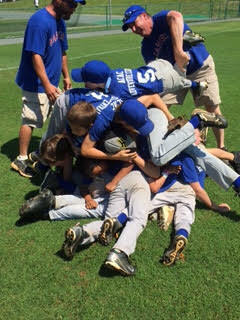 Image: Rangers' dogpile after their upset win! Image: Some Pirates holding the 2015 and 2016 tournament hardware at the post-game team picnic.